Episode 28 – Would You Rather…? In this episode, the Prairie Girls play a game of “Would You Rather…?”. Both girls are proudly sporting gold medals from the 2014 Ravellenics! Susie finished her Ahoy Matey! or The Pirate Pullover. She has received outside approval on her seed-stitch seaming and so is satisfied. Overall she likes the project a lot, and looks forward to seeing it in action sooner than later. 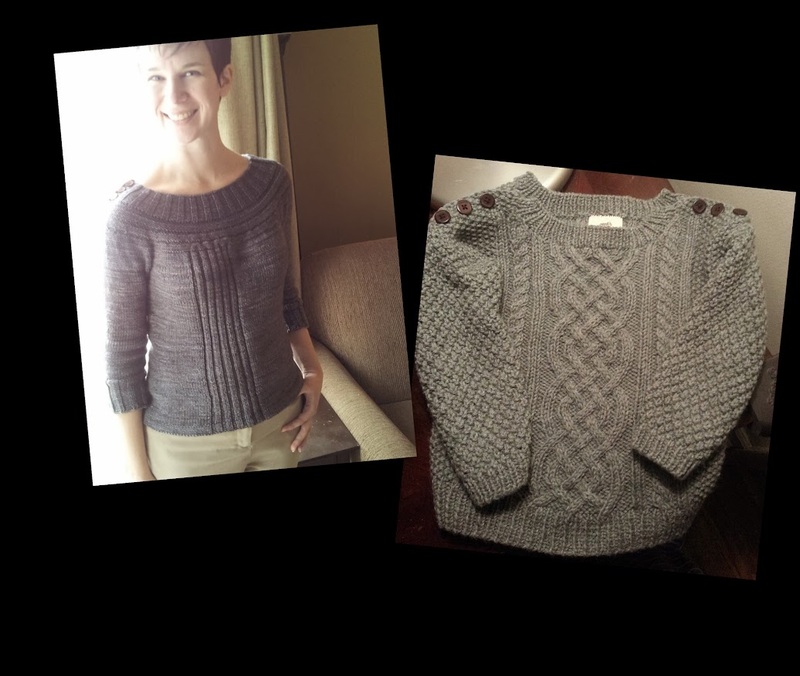 Danie finished her Middlefield Pullover. It is down to the ground amazing. She continued to battle speed bumps until the very end, having to knit the second sleeve twice after discovering four extra stitches. She is extremely happy with the fit. Susie worked more on her Conwy socks, and is close to starting the heel flap. She had a son of a stitch with the Learning Curve she started Thursday evening, but rebounded with the Elizabeth Shawl, and feels it’s a good fit for the Maple Ridge Lace in the Tansy colorway. The new meaning to Danie’s life is the Miranda sweater, inspired by a friend’s version. She is using Knit Picks Swish DK in Indigo Heather. She has a niggling doubt for some reason as to the ease, but is going to try to have faith and keep going. Join the Prairie Girls in their game of “Would You Rather…?”! Post yours by March 30th in the contest thread in the Ravelry group to be included in a drawing for a beautiful Halcyarn bag. Danie coined a new phrase, and Susie started Couch-to-5K. In this episode, the Prairie Girls recap their 2014 Ravellenics progress through Day 13. Susie stalls on seaming, and Danie folds her first hem. Miscellaneous projects, shops, and patterns mentioned include Susie’s February Lady Sweater and Hiro, The Dyeing Arts, and the Hitofude Cardigan. Join the Prairie Girls on Team Sasquatch for the 2014 Ravellenic Games! Danie is knitting the Middlefield Pullover, and Susie the Ahoy! Matey. Susie completed the knitting on her Ahoy Matey! or The Pirate Pullover, but has stalled on the seaming. She’s not crazy about how her seams are looking in seed stitch, but Danie assured her they are just fine. She is planning on plowing through it in the next evening or so, and move on to the buttons. After finishing the knitting, she thought she could let herself enjoy a little knitting on her Conwy socks. They are being relegated back in to hiding, though, so she finishes her Ravellenics project in time. 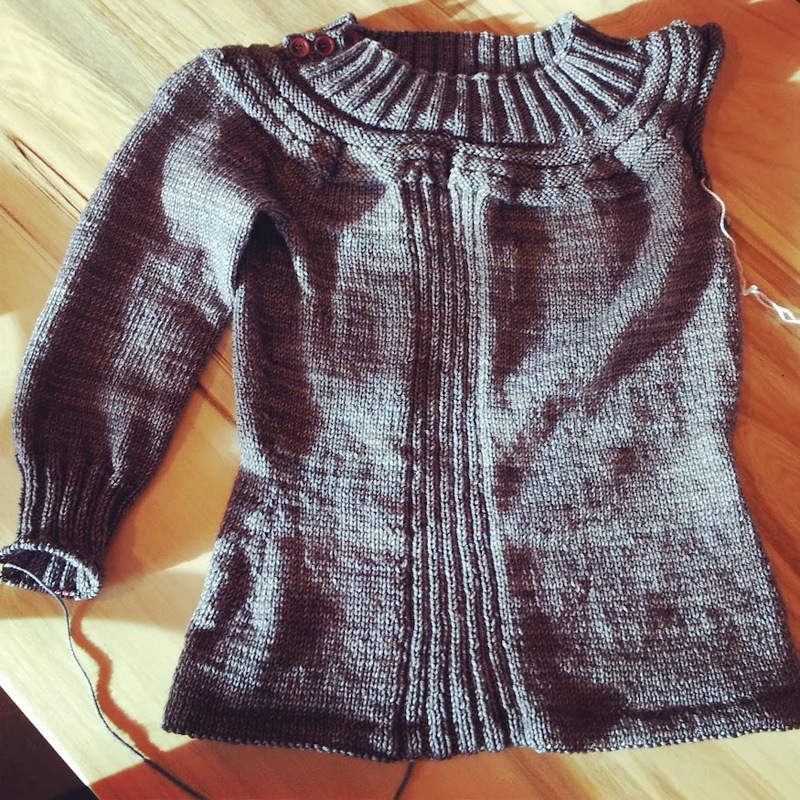 Danie finished the body and most of the first sleeve on her Middlefield Pullover. She had to recalculate and dramatically change the waist shaping, but this sweater will suit her perfectly so it was well worth the time and effort. She also had to re-do the sleeves a few times to get a fit she is happy with, but with the first one nearing completion she is hopeful the next sleeve will fly by. Susie has allowed herself to start thinking about knitting after the Ravellenics, and is considering the options for some Araucania Nature Wool Solids from deep in her stash. She has narrowed the choices down to Dark and Stormy, Pumpkin Ale, Brandied Cherry, or Grenadine. Susie got two skeins of Wollemeise Pure 100% Merino Superwash in Ein Klein Wenig Verrucht for her birthday! Inspired by listener HeatherBrum’s Grow Old with Joeby sweater project, Susie ordered labels from Mountain Street Arts on Etsy. They haven’t arrived quite yet, but is already very impressed with their customer service. Both Prairie Girls are enjoying a new audio podcast, ACTually KNITting. In this episode, the Prairie Girls recap their 2014 Ravellenics progress through Day 4. Susie sets herself a good pace, and Danie gets back on track after taking a couple penalty laps. Join the Prairie Girls on Team Sasquatch for the 2014 Ravellenic Games! Danie will be knitting the Middlefield Pullover, and Susie the Ahoy! Matey. Danie worked on her Wrapped in Leaves shawl but feels like she didn’t make a lot of progress. Conversely, her StarBrite Socks now have a fair amount of leg. Susie finished the first of her Conwy socks. She decided to go for it, and did the contrast toe “plus” in leftover red sock yarn. Susie is reconsidering her Providence Hoodie (correction: designed by Melissa LaBarre). Looking at it again, she thinks she going to reconsider reconsidering it, and may hang on to it. Susie finished the front of her Ahoy Matey! or The Pirate Pullover. She needs to finish the first sleeve by the end of the week to get to the halfway point, and she feels comfortable with that pace. Danie is feeling good about her progress on her Middlefield Pullover, despite her ease concerns. She has separated for the sleeves, and is pleased by the fit so far. Susie got a fabulous new project yarn from Halcyarn. It is her perfect project bag, and she loves it. Danie discussed the pros and cons of the knitting seen at the 2014 Olympics. In this episode, the Prairie Girls talk about sweater construction in a round-about way. Susie experiences sweater love, and Danie’s creative juices flow. The girls mention Cast On Bind Off, Ply magazine, and the Killybegs cardigan from Contemporary Irish Knits. Susie finished her Hiro and is in love. Susie worked on her Conwy socks. She turned the heel and is cruising through the gusset decreases. Danie experimented with turning short rows in ribbing and on a new afterthought heel. She also worked on her Wrapped in Leaves and her StarBrite Socks. She also made a returned to spinning, and the Malabrigo Nube in Plomo.